We are solving series of problem on the topic expansion of solids. When ever heat energy is given to a solid materiel, the molecules starts vibrating about their mean position and when the given heat energy is withdrawn, they fail to get back to their original positions due to lack of perfect elasticity. Thus there is a dislocation in the positions and that leads to the expansion of the solid material. Its expansion along the length is measured with coefficient of linear expansion, along area is measured with coefficient of areal expansion and along volume is measured with coefficient of volume expansion. We can see lot of real life applications of expansion of solids in daily life. A small gap is left between two rails of railway track so that they can expand in the gap during the summer with out disturbing the structure. Telephone and electric wires on the poles are fixed little loosely so that they can contract in the winter without breaking. Tungsten is used as a filament in electric bulbs as the coefficient of linear expansion is close to the coefficient of linear expansion of glass and with the rise in temperature is same for both of them with the given heat energy. 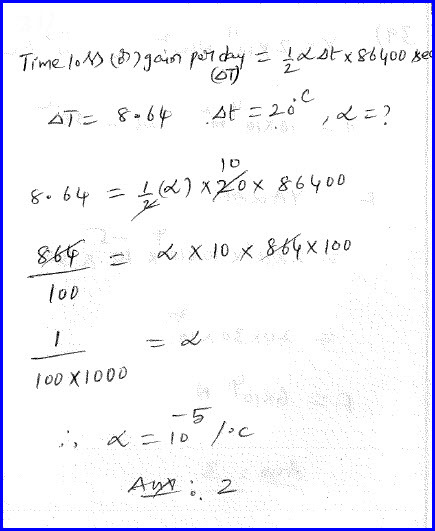 Time period of pendulum clock at 25 degree centigrade is given in the problem as two seconds. It is given that at a higher temperature it looses certain time and basing on that we need to find the coefficient of linear expansion of the material and the problem is as shown in the diagram below. With the raise of the temperature length of the pendulum increases and hence its time period also increases. Thus the pendulum makes less oscillations per day and hence there is a loss of the time with the raise in the temperature. 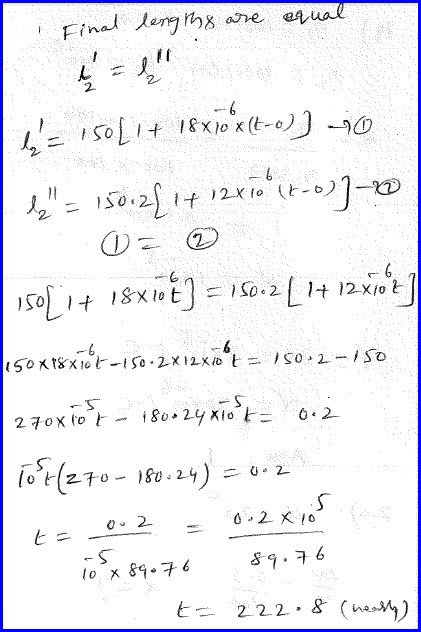 We have derived a formula for that and by using it we can solve the problem as shown in the diagram below. A steel rod of known area of cross section is tightly fixed between two rigid supports and it is not allowed to expand even when its temperature is raised and we need to find the thermal stress developed in the rod. Problem is as shown in the diagram below. With the given heat energy the body is supposed to expand but we have fixed it tight such that it cannot expand. Hence a tension and stress is developed in the rod and we can express it basing on the young’s modulus of the rod. In the place of expansion, we shall substitute the value basing on the coefficient of linear expansion definition and the problem can be solved as shown in the diagram below. 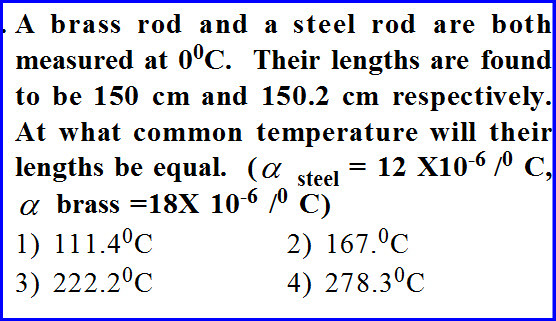 A brass rod and steel rod are having different lengths at a given temperature. We need to find out at what common temperature their final lengths will be equal. Problem is as shown in the diagram below. We know that as their coefficient of linear expansion are different, they are going to expand differently with the raise in the temperature. By writing their final lengths equation in both the cases and by equating them we can solve the problem as shown in the diagram below. 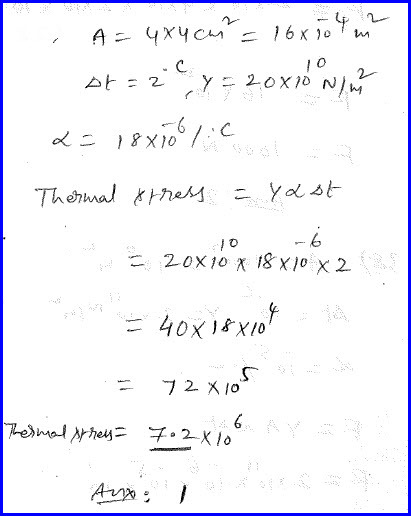 Coefficient of linear expansion of the materials is given to us. We can solve the problem as shown in the diagram below. 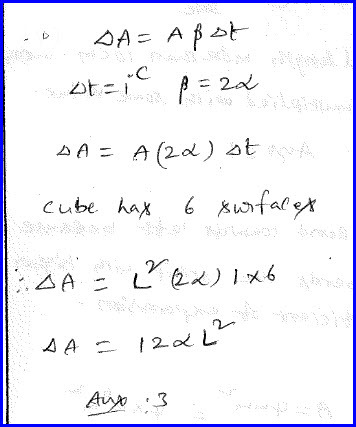 A cube of known side and coefficient of linear expansion is given in the problem. We need to find the increase in its surface area with the raise of the given temperature and the problem is as shown in the diagram below. We know that change in the area is measured in terms of coefficient of areal expansion and it is double to that coefficient of linear expansion. By writing its definition, we can solve the problem as shown in the diagram below.